"Augmented reality (AR) is a live, direct or indirect, view of a physical, real-world environment whose elements are augmented by computer-generated sensory input such as sound, video, graphics or GPS data. It is related to a more general concept called mediated reality, in which a view of reality is modified (possibly even diminished rather than augmented) by a computer. As a result, the technology functions by enhancing one’s current perception of reality." How can Augmented Reality be used in the classroom? I am always looking for ways to inspire, motivate and engage children. Augmented Reality definitely provides the WOW factor in the classroom. 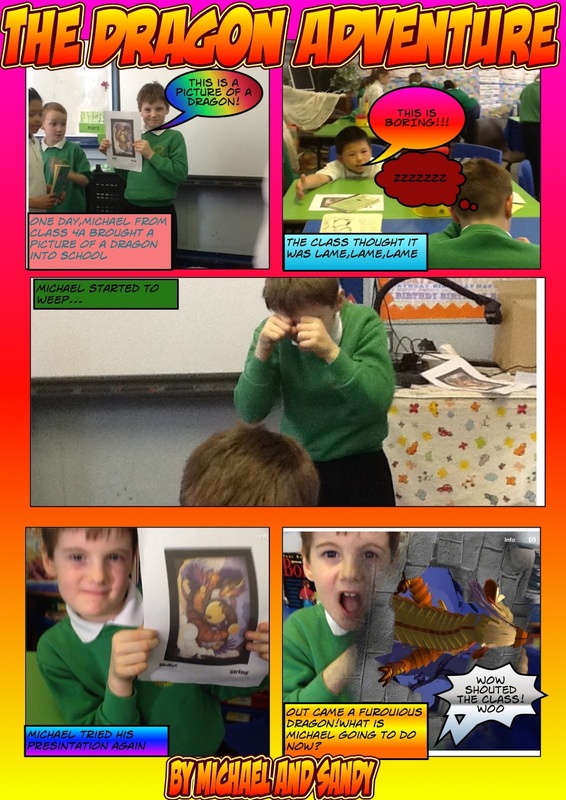 The reaction of showing the a class some examples of AR was that of utter shock, amazement and complete awe. Children are fascinated to see how a picture they have drawn or made can transform into a video. They are perplexed by how it works and definitely enthralled by the sense of magic that AR provides. Recently I have been doing a lot of literacy work with a group of Year 5 based on the app "Epic Citadel," this is a wonderful free app that allows the children to navigate around a dynamic fantasy setting which is the backdrop to the game Infinity Blade. Without characters and storyline, the app lends itself to the classroom as it provides the setting but allows children to use their imagination to add characters and a story line. To begin with I wanted to let the children roam the app and generate descriptive language and make a word cloud that can be then referred to later for more writing. - See the word clouds made by the class. The next lesson I used slow writing to help the children write an introduction to the setting of Epic Citadel. 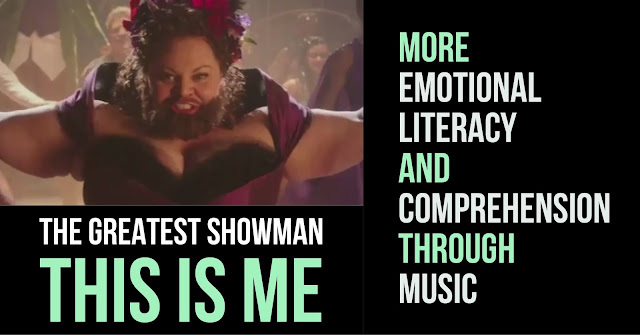 But I didn't just want it to be written in their books I wanted to bring their writing alive. I decided to use Aurasma to make this happen. Firstly the children needed to make an overlay - the animation/video that will play once a trigger image has been scanned. 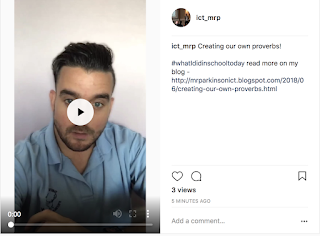 So once the children had completed their writing, they narrated it over some screenshots of the app to create a short video using iMovie. Children opened the Epic Citadel app and used the home and lock button to take screenshots of different scenery and then recorded themselves reading their writing. Once they had exported this is was time to bring their video to life using Augmented Reality! 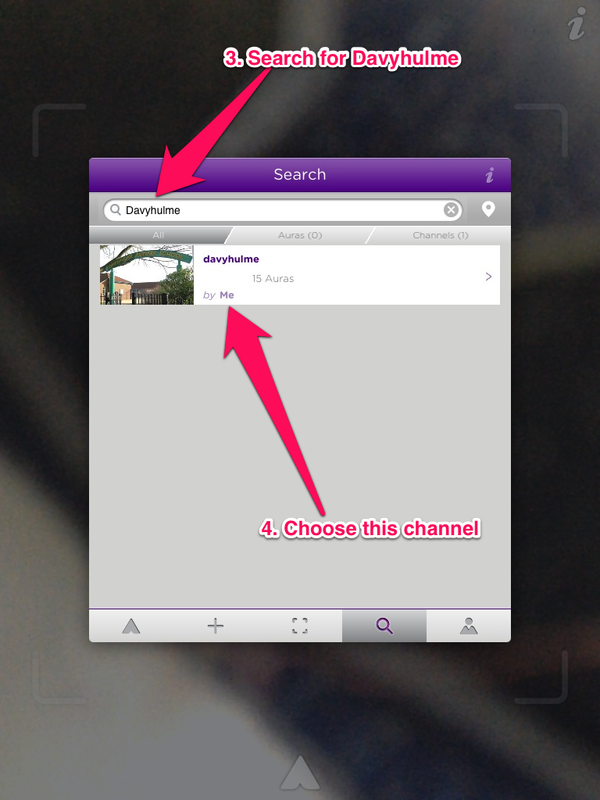 Download the app “Aurasma” onto your Smartphone. Open the app and press the A at the bottom of the screen. 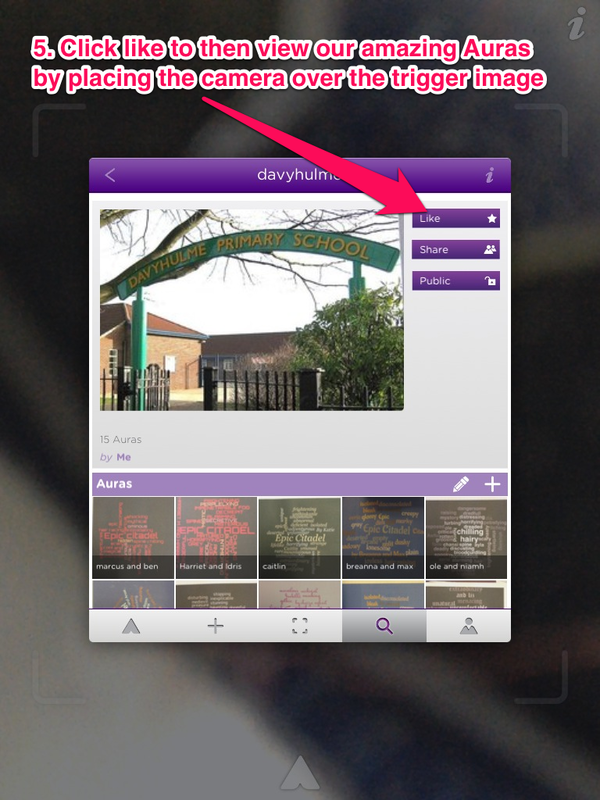 Type in Davyhulme and click the option. Press like to subscribe to our Auras. Open the app and scan one of our pictures, if it doesn't work from your screen you may need to print the word clouds. Watch in awe the amazing descriptions of the fantastic world of Epic Citadel. Using Augmented Reality in the Classroom from Davyhulme Primary School on Vimeo. I was asked that when I work with Year 6 on a Thursday could I use the iPads to help the children prepare for the controversial SPAG test. I found a few apps to use which the children really enjoyed but the biggest reaction was when I used Augmented Reality for the children to demonstrate their understanding of using different punctuation marks and parts of a sentence - you can see the punctuation lesson and examples here or click here for the parts of a sentence lesson. I am planning something very similar next week with the other Year 6 class but focusing on different word types - Nouns, Verbs etc. 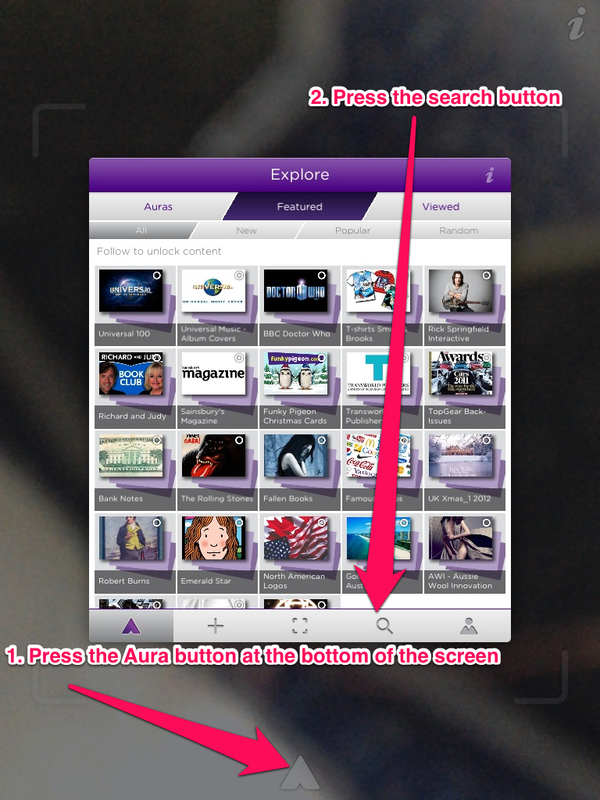 Aurasma is definitely an app with lots of potential. I am truly excited by the prospect of using this app right through the curriculum and in different Key Stages. Making a truly interactive display, rather than putting up work with explanations from teachers, examples of work could be used to trigger video explanations from the children. When looking at an example of a particular text type children can scan it to reveal the features used or more of an in depth analysis. In Numeracy, teachers can make an aura showing a particular method for solving a calculation that children can scan to remind them. Science/History/Geography topics can be truly brought to life. Rather than just using a book children can scan an image to reveal videos and images packed with much more interesting facts and information. A chemistry teacher could make a fully interactive periodic table where all the elements can be scanned to reveal more in depth information. Lower down the school, to help children with initial words for reading, auras can be created to associate a word with a particular picture. They could scan numbers to reveal pictures of the number - for example - the number 3, scanned reveals 3 apples. Making learning much more visual and engaging. Assessment - AR could reduce so much paperwork if an aura was made for a child to show a recording of them reading, or working on a particular maths objective. You would be able to demonstrate that children can meet certain objectives. Imagine scanning a picture of a child with a leveling sheet to then reveal examples that back up your judgement as a teacher. Aurasma is definitely a great app for generating, sharing and scanning examples of AR, however there are other Augmented Reality apps that can really spark some creativity in the classroom. String - This app provides a teacher with some awesome Augmented Reality that would be perfect as a stimulus in Literacy. Aliens invade Davyhulme from Davyhulme Primary School on Vimeo. The almost magical aspect to Augmented Reality really fascinates the children. 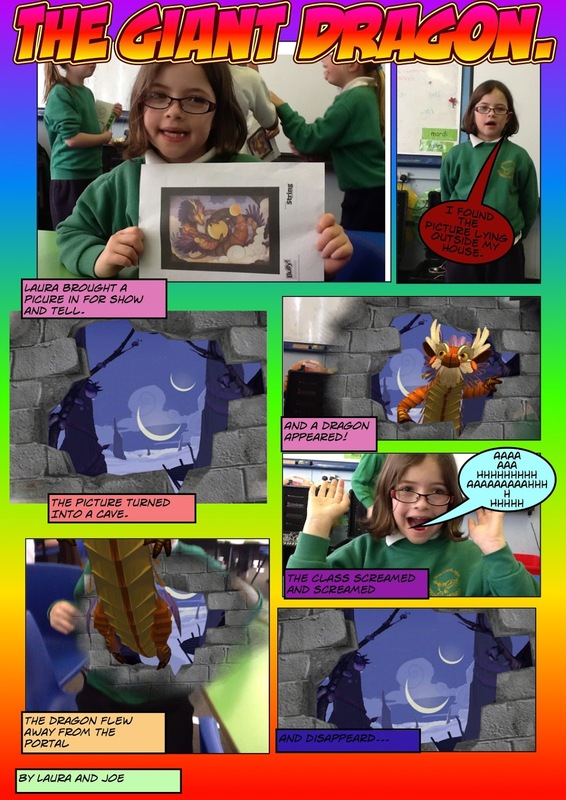 I used the same idea for the Dragon image to inspire children to make their own comics about a Dragon in the classroom. - Read more about the lesson here. First News + - First News, the popular children's newspaper, now boasts that it is the world's first fully interactive newspaper. 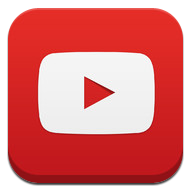 Using AR children can scan certain articles to reveal more content through videos and pictures. Having used this already, the children love being able to learn more about a particular news story. Zooburst - This app allows you to make a fully interactive 3D pop up book. Children can import characters, setting, pictures and add sound effects or record their own voices. Once a book has been made a special code is generated which uses Augmented Reality to generate your story by scanning the code. There is a cost to sign up for full access of the Zooburst but their is plenty of potential for some fantastic writing opportunities. Absolutely amazing ideas! Thank you so much for sharing these. I have just discovered AG and am taking the first steps to using it in the classroom. I will definitely be trying out some of your suggestions. Hi, I downloaded the string app but all the links to find the PDF triggers take you to a site that looks like its been disbanded. Do you have any ideas where else these can be found? I'd love to try them in class. Thank you so much from Spain!! Such an amazing idea to make our class more enjoyable! I love it! I love Aurasma. 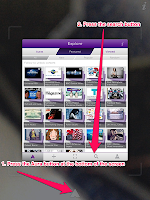 I used it recently to create.a READ BOX where I videoed student's reading book summaries. I am currently working on creating an interactive tour of our school for our 6th celebration. Any suggestions for how to set it up? I wish use the ipads in class to make a Sky news type report with the report also flashing across the bottom of the page... I know how to do the videoing its putting in the rest of the stuff that I don't know how to do...can you help?